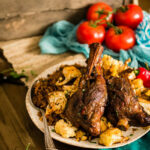 Braised Moroccan lamb shanks with harissa and other African flavors is the perfect fork tender recipe; just like what I enjoyed while traveling through Morocco. Pat the lamb dry and season liberally with salt. In a Dutch oven or braiser, heat the oil over medium-high heat and brown the lamb on all sides, 7 to 10 minutes. Remove the lamb and cover. Add the onion and carrot to the Dutch oven and a saute 3 minutes. Add the garlic, cumin, coriander and nutmeg. Mix in the tomato paste, stirring to coat and toast for 30 seconds longer. Add the wine a little at a time and deglaze the pan by scraping up the browned bits. Whisk in the broth, tomatoes, harissa, and raisins. Season with salt and pepper. Nestle the lamb back into the Dutch oven and cover. Transfer to the oven and cook for 60 to 90 minutes, until the lamb is fork tender. Remove from and let rest 10 minutes before serving. Garlish with fresh sliced olives and chopped parsley. I served this over a mix of lentils, bulger and rice with roasted cauliflower to soak up the juices.